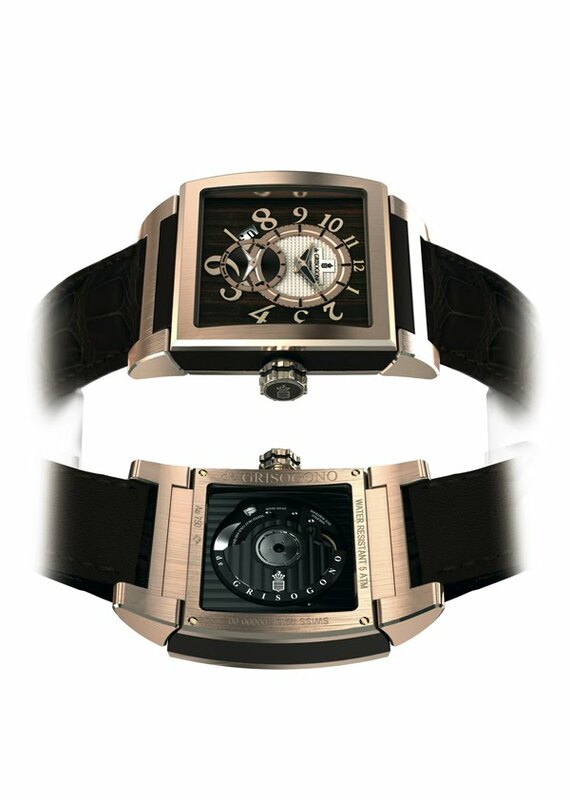 Basel, Switzerland, March 2012 – This spring, de GRISOGONO is unveiling a timepiece rife with superlatives. The new INSTRUMENTO N° UNO XL dual-time, passionately created by Fawaz Gruosi, embodies the brand’s emblematic contemporary baroque style, appearing for the first time in a model exclusively dedicated to men. Superbly legible and easy to use, it features more generous dimensions and an exotic touch through the materials composing it: white or pink gold, black or brown titanium, and precious Macassar ebony wood. The new INSTRUMENTO N° UNO XL radiates sophisticated exuberance. This original and eminently modern timepiece displays distinctly larger dimensions with a 30mm x 30mm dial, as well as a case adjusted to this new size. A finely crafted new self-winding in-house developed movement, Calibre DF 11-96, is user-friendly and powers these exceptional timepieces. It drives a dual time-zone display that will please travellers and is adjustable via the crown. This movement is developed internally by the new de GRISOGONO’s Technical Development Department team. Various meticulously crafted finishes anchor it firmly in the finest watchmaking traditions. Coated with a “blackened gold” treatment and visible through the sapphire caseback, it is adorned with the famous Côtes de Genève motif. The date function is displayed through an aperture positioned in an original spot between 7 and 8 o’clock and topped by a magnifying glass ensuring a clear reading. Resistance to 50 metres is ensured by systematic testing at 5 atm. de GRISOGONO confirms its tradition of excellence through this watch designed specifically for men. The two models available are distinguished by a complex structure combined with noble materials. One is clad in white gold, black PVD-coated titanium, and dark ebony on the dial. The other appears in pink gold, brown ebony and chestnut brown PVD-coated titanium – based on an original technique perfectly mastered by de GRISOGONO. In addition, this PVD coating is given a specific treatment that protects it from any marks or stains. Each model comprises around 100 grams of gold. This opulence is echoed in the use of precious Macassar ebony evoking 17th century baroque art. Imported from the Celebes islands to the north-east of Java, this type of wood features regular veins and is a noble and living material that evolves over time to make each watch a truly unique and organic creation. The carefully mastered curves of the two counters appear against this refined ebony background, each displaying an independent time zone. The finesse of the decorations is echoed on the central counter with its “Clous de Paris” hobnail guilloché motif; as well as on the brown decorative sunburst brushed dual time-zone display in brown for the pink gold version and black for the white gold interpretation. The stylised numerals in different dimensions are gracefully arranged around these tiny discs. The lugs are adjustable thanks to a patented mechanism created internally which ensures a perfect fit on all wrist sizes. "This INSTRUMENTO N° UNO XL is inspired by nature, using ebony in a totally innovative way in watchmaking: a characteristically bold move from de GRISOGONO.” explains Fawaz Gruosi. The original and technical new INSTRUMENTO N° UNO XL sweeps its owner into a unique journey accompanied by the scent of ebony and a sense of unmistakably contemporary refinement.